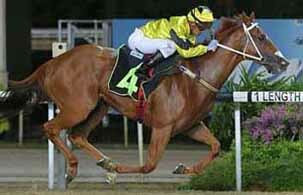 Two newcomers SALVADOR and BARTIMAEUS, who had arrived as maidens, made winning debut at Kranji here tonight. SALVADOR was placed four times in six runs at two and three in Australia. With bang-inform rider Noh Senari in the saddle, quickly made his mark to win the Open Maiden event over 1200m. "I didn’t think he could win from the bad draw to be honest. I thought he would be three or four wide, would struggle to get in and would run out of gas, but he got a very good ride from Noh," said trainer Steven Burridge. BARTIMAEUS was placed third in his only run in New Zealand and showed promise with an easy win in the Class 4, Div 1 sprint over 1200m on the polytrack. "I didn’t have much confidence as the horse was racing here for the first time. 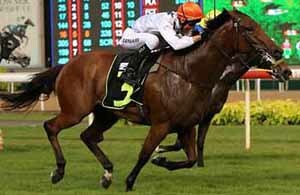 It’s still a big unknown," said trainer Alwin Tan. "But based on his condition, he was fit enough and we just had to see how he would go. I told the owner we would give it a try." BARTIMAEUS paid $117. Meanwhile, MIKKI JOY, who won five times over the mile in Japan, was off the mark in Singapore in the Kranji Stakes B event over 1600m, after unplaced debut over 1200m last month.